By the beginning of the 17th century the development of artillery meant that strong castles were no longer being built because they were no longer effective against large guns. Houses were now being built for comfort rather than for defence. The only defensive structures were the early star forts such as James’ Fort and Charles’ Fort at Kinsale. The early defensive walls of some Irish towns were no longer effective and many of the newer towns such as Derry and Carrickfergus were building stronger walls. The Plantation of Ulster led to the building of smaller defensive units such as bawns. These were effective only against lightly armed insurgents. The 18th century was a period of relative calm in Ireland and it was during this time that many of the large houses were built. At the end of the century defence was again a major issue due to the threat of Napoleonic invasion. 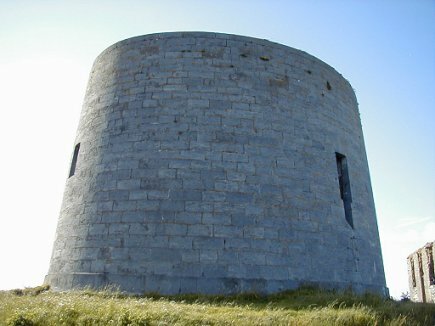 Many strong batteries and martello towers were built and some of the early star forts were adapted. The Industrial Age of the 19th century saw the construction of many of the great engineering projects associated with the canals and railways and great improvements in roads and bridges. Many mills and factories were built and towns increased considerably in size.